The last time I ate queso I told myself I would never do so again. It almost seemed as though it congealed in my insides and I was worthless for the rest of the evening. However, I got the hankering for it recently (how Texan is that phrase?) and set out on an adventure to make queso without the boxed stuff. You know what I'm talking about -- The V word that I'm not even remotely convinced it's any kind of real cheese. 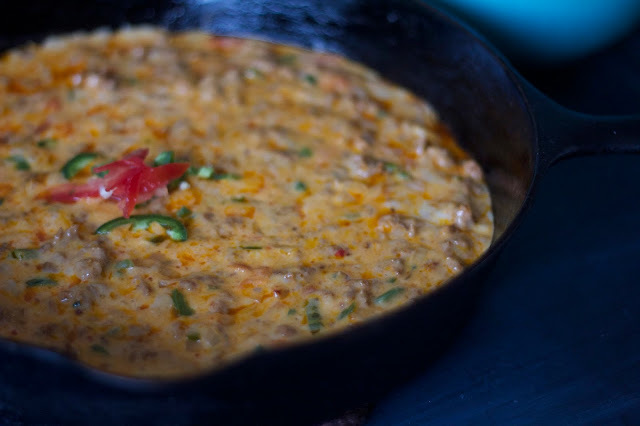 I have to say - this queso is incredibly delicious and is so full of fresh flavor that isn't from a can of spiced tomatoes or a cup of chili in the shape of a can. I picked up the produce, package of cheese ((already shredded because who has time to shred their own anyways? )), a half pound of fresh chorizo from the meat counter at Whole Foods. I came home and got out my trusty cast-iron skillet. I always feel so legit when I use that heavy sucker. 1. Chop the jalepeno, onion, and tomato and put aside in a bowl. 2. Chop garlic and cilantro and set aside, as well. 3. Brown the chorizo on medium heat in your skillet, breaking it up as it cooks. 4. Once the chorizo is finished cooking, add the bowl of tomato, onion, and jalepeno. Cook for a few minutes until the jalepeno and onion are tender. 5. Add garlic and stir around for a minute or so. 6. Add cheese and gently stir while it melts. 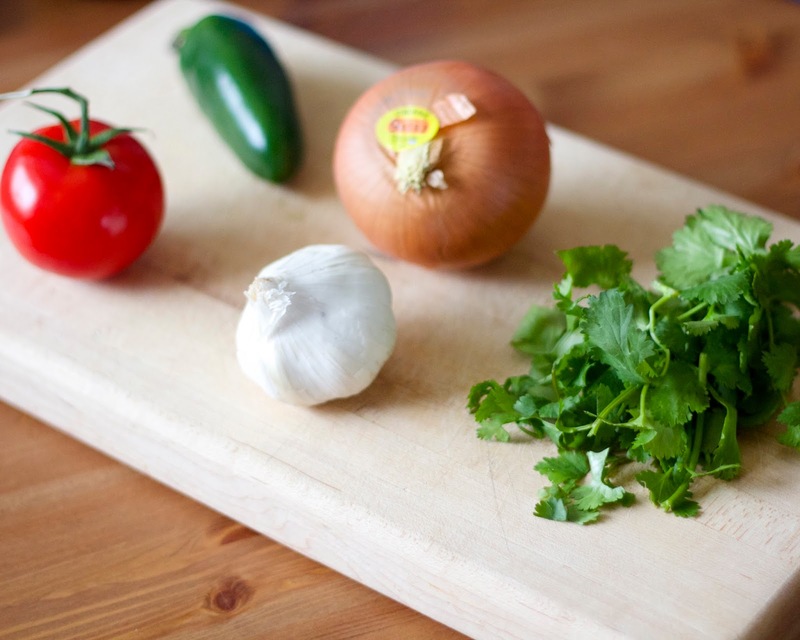 Once it is almost melted, add the cilantro and continue to stir, making sure to incorporate all the other ingredients. This would be perfect as an appetizer for an upcoming get together. It takes about 10-15 minutes to make and you can just set it on the table with a bowl of chips. I know for a fact that I'll be making some for our third annual Cinco de Mayo fiesta this year. Leave a comment with your favorite party appetizer for a chance to win a $25 whole foods gift card. Two readers will win! I love queso. ALL DAY. favorite appetizer is definitely egg rolls. not positive if they fall into appetizer category but thats where i put them. definitely one of my faves!!!! Yum this looks delicious! My favorite appetizer is buffalo chicken dip :) Thanks for the recipe! I make a rueben dip that is awesome! A big tray of cut up veggies and healthy dips! Sounds so good! I usually make guacamole with HEB Mango pico mixed in. It is yummy! Although this is pretty seasonal around the holidays, I absolutely LOVE a good cranberry salsa using fresh (and a few frozen) cranberries, cilantro, onions, jalapenos and a bit of sugar. It's a perfect salsa to serve with tortilla or pita chips! This looks so good!! And I'm always a fan of spinach dip..
Chips and salsa or guacamole or queso! Sometimes I'll mix all three. Flavor explosion! Also, thank you for putting up this recipe for skillet queso. I will be trying it out soon because, regrettably, most Californians believe that "queso" is simply the spanish word for cheese. They have no idea what I'm talking about when I say I'm craving queso :O(. I think I'll have a queso party and make them all try it. 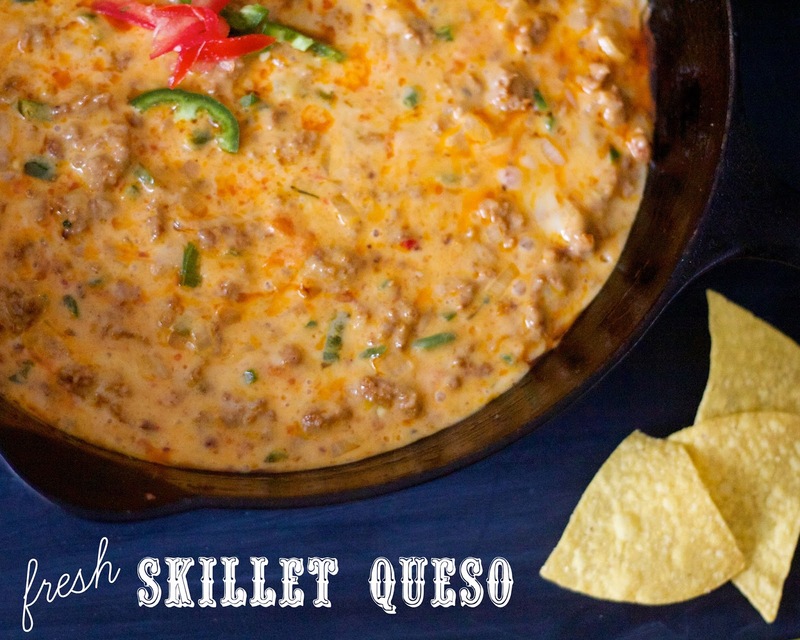 That skillet queso looks delicious (and super easy to make) - I'm glad you shared the recipe! My favorite thing to bring to others is Texas caviar - a ton of sliced peppers, corn, etc. It's super simple and delicious! This recipe looks SO good! I love stuffed mushrooms as a party appetizer. We always make spinach artichoke dip! 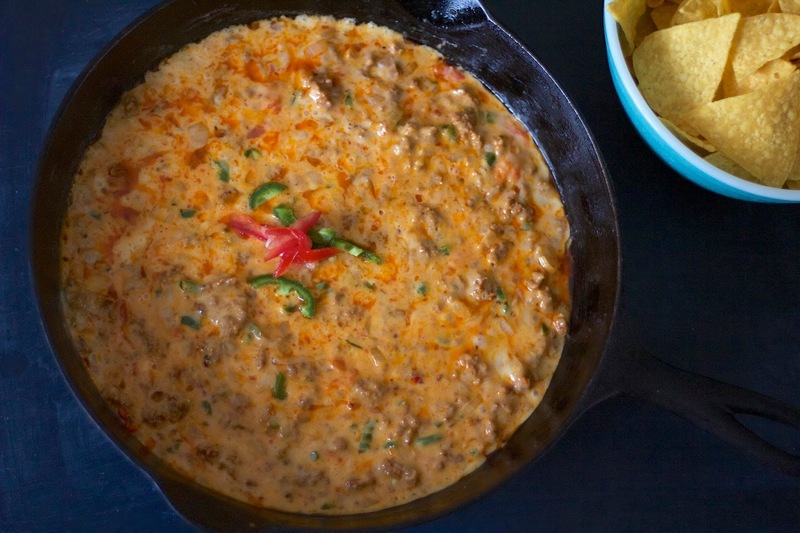 I'm such a dip fan -- and queso is delicious. 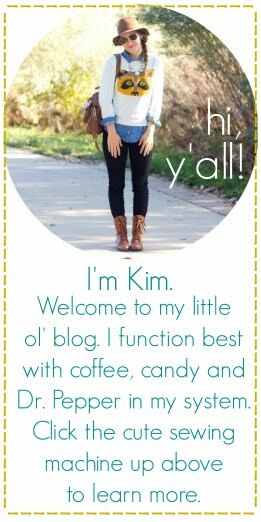 My all time favorite is probably artichoke spinach dip... yum! Hot Spinach dip and tortilla chips! This queso is making my mouth water! My favorite appetizer is cornbread stuffed jalapenos! Mmmhmmm! White bean hummus and garden of eatin' multi-grain chips! My favorite apps are Buffalo Chicken Dip OR homemade pretzels!! Both are yum. Um the splash of tequila! I would I have never thought to add that. This looks so yummy!! I have a recent obsession with sausage balls as an appetizer... Please don't judge haha! My favorite is warm brie w/jam on top, or wrapped in one of those crescent roll things. A yummy guac as well as Spinach & Artichoke dip are my all time fav!!! I like to make 7-layer Mexican dip. So glad you posted this, I needed a fresh version! Fave appetizer, bacon wrapped chestnuts. A family tradition.